Officially Britain’s fastest-growing homes magazine, Good Homes is a monthly magazine offering inspiration for making your home even more beautiful. Each issue is packed full of the latest decorating trends, interior design ideas and seasonal looks featuring inspiring real life houses. This includes before and after transformations showing design makeovers and extensions, detailed home improvement guides, craft ideas and delicious recipes. With your Good Homes subscription, not only will you get the magazine delivered to your door for free each month, but you will also receive free supplements on key design topics throughout the year. Order your subscription to this award winning magazine today and start feeding your inspiration. Over 150 new looks for Spring… Colour splash – add a wow factor to every room… Before & after – kitchen and bathroom updates… Room makeovers from £50… Springtime Scandi schemes… Over 100 high street bargains under £25… New season denim blues… Buyer’s guides to kitchen gadgets, flooring and radiators… De-clutter every space… Decorate with sunny yellow shades… Spring’s chic new neutrals… Easy bank holiday projects… Eight real homes packed with ideas to steal… Order your Good Homes Magazine subscription today for more great articles like this every month and start transforming your home. 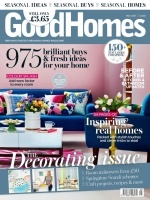 Who Reads Good Homes Magazine? The magazine is designed for contemporary women with an interest in interior design and beautiful homes.